Squeaky Books: Happy Holiday Weekend! Let's have a contest! Happy Holiday Weekend! Let's have a contest! All right! Here we are, approaching the 4th of July weekend! What better way to celebrate then with a free book?! 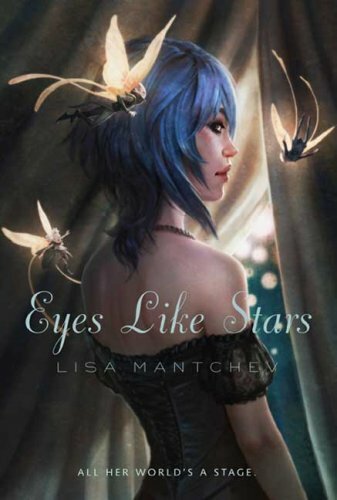 Many of you have heard of Lisa Mantchev's upcoming book Eyes Like Stars(here's a link to my review). Well, would you like a copy? I'll be giving away a copy in celebration of our Freedom day. All you have to do is post a comment here. If you post about this contest on your blog and post a link here, I'll give you an extra entry. Easy. Straight forward. And fun! Entries will end on Midnight (Mountain time) on Wednesday the 15th. I'll announce the winner one week from today and I will mail out the book as soon as I get the winner's address. No international entries. I'm sorry, but I can't afford that. Enter! Yes, a free book! Do I count? Pick me, pick me! Ooh, I'd love to win this book! I've heard this book is excellent, and I can't wait to read it! My friend got an ARC of it--actually, two!--so I know this is a good read! My e-mail is lady(dot)dashti(at)gmail(dot)com, and I just blogged about it at my blog, Blog of a Thousand Days: http://perfectgoodluck.wordpress.com/. PS, this is not a contest entry. How exciting! Thanks for the opportunity! I want a free book! You love me you really love me!! This book looks great! I'd love to read it! Link to my blog post about the contest: http://amyliz2008.blogspot.com/2009/07/contest-from-squeaky-books.html. It's the 15th, and it's not midnight! I made it? This was a pretty darn good book. A super-fun interview, with me! Pshaw. Look at me, eager beaver!